I wrote this as a flash-fiction piece based on my book Reapers. I hope you enjoy it. Hanoi opened the door. Chatter and the odor of beer and pizza filtered in. Keeping my shoulders back, I walked into a mass of people holding plastic cups and plates. A curtain of silence fell. Everyone looked at me. My father stood near a punch bowl, aloof, as usual. I spotted Misty to his left. Her fiery locks made her easy to find, and her bright smile lit up the room. A woman stood next to her. Blonde hair draped her cloaked shoulders, and an expressionless white mask hid her face. The Council member. Misty called with her distinctive Scottish accent, “Ah! You look dashing—” She glanced at my father, then quickly turned her gaze downward and rubbed a pewter ring on her finger. I read his expression—utter disapproval. But no matter. Reaper service would keep me away from Misty for twenty years. He had nothing to worry about. As I walked to the center of the room, the crowd parted and lined the walls. I scanned the faces for glowing eyes—a stooped man in military garb, a teenaged girl wearing a bloodstained prom dress, and a scar-faced man clutching a bottle. Three ghosts? Why three? Behind the woman, the scar-faced ghost stalked closer to Misty, his glowing eyes trained on her. I had no experience with hostile ghosts. Could this one hurt her somehow? The guests looked around, whispering, some with fear-filled eyes. The ghost sneered. “I am her next nightmare.” He leaped on Misty’s back. She gasped, and her face paled. I lunged and whipped my cloak over the ghost. When the fibers adhered, I wrenched him to the floor. He plunged a hand through my sternum valve. His icy fingers grabbed my heart and squeezed. Her words brought a surge of warmth. One arm loosened, and my hand dematerialized. I curled my disembodied fingers around the ghost’s throat and pushed him away, drawing out his frigid hand. With my physical arm, I wrapped him in the cloak again and focused on the energy coursing into the fibers. As the material burrowed into the ghost, he screeched. His face elongated, and his glowing eyes exploded into dark mist. Seconds later, every particle vanished into the cloak. The screech continued, now muffled. I unplugged the clasp from the valve, silencing it. Misty crossed herself and rose to her feet, whispering something indistinct. She set a cold finger on my lips. “Never mind. Just know that I will be watching you.” Her metallic eyes, visible through the mask’s holes, drilled into me. “Tomorrow, you will not remember my presence here.” She rose and hurried out of the house. His words felt like the ghost’s icy grip, freezing my heart. After reaping the other ghosts, I stumbled through the ceremony—reciting my pledge, then receiving a weapons belt for protection in a remote city, far from my parents … and from Misty. I slid in next to her and looked back. Misty waved from a window. I managed a weak wave in return. A large hand snapped the drapes closed, hiding her from view. I shut the door. The limo pulled away, and my house faded from sight. I sighed and fingered my own pewter ring. Separated from my loved ones, twenty years would feel like an eternity. You might be able to guess the identity of the masked woman. Gah! I know exactly who she is. I have a slight guess that the masked woman is Alex, though I’m not sure. My guess as well. I really dislike her. 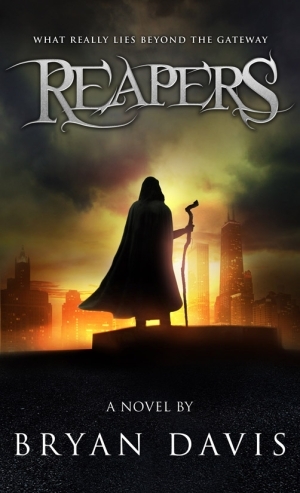 Gah, I still haven’t read Reapers yet! I really need to request it at my bookstore. I loved this, I think this would have made a great prologue to include in the books.